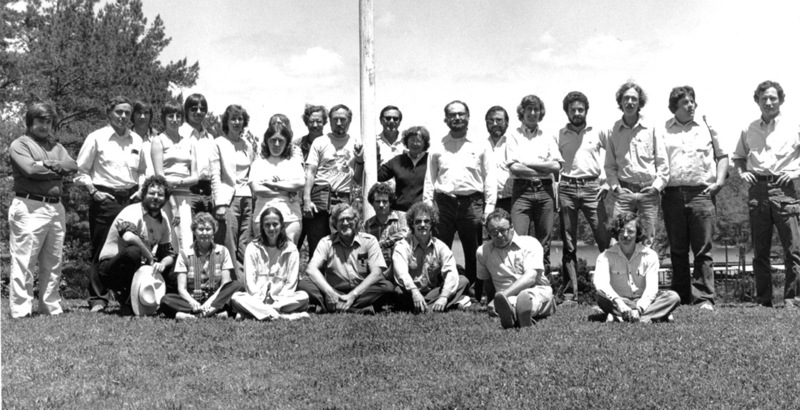 Attendees at the State Plan meeting at Lake Ouachita in 1979. Passage of federal historic preservation legislation, including the Archeological and Historic Preservation Act of 1960 and the National Historic Preservation Act of 1966, brought forth requirements for state agencies to participate in assessments of potential impacts that federally funded projects might have on historic properties including archeological sites. This, in turn, raised concerns about the need to organize review and planning resources (such as archeological site and project files) and strategies (including coordination between different agencies and offices) at the state level so that available historic preservation funds could be most effectively utilized. Consequently, during the late 1970s the National Park Service (NPS) developed a Resource Protection Planning Process (known as RP3) and initiated efforts to support pilot planning projects in select states. Arkansas was one of the selected states, along with Idaho and Massachusetts. With $3000 in funds provided by the NPS, the Arkansas Archeological Survey (ARAS) was charged in 1978 with the responsibility of developing a plan to guide archeological research in support of federally mandated reviews. After a short period of back-and-forth deliberation, ARAS convened a three-day workshop in which staff archeologists developed a framework for creation of what was eventually published as A State Plan for the Conservation of Archeological Resources in Arkansas, edited by Hester A. Davis, Arkansas Archeological Survey Research Series No. 21, 1982; revised 1984, 1992. Upon its completion, the State Plan was accepted by the NPS and subsequently adopted as standard operating procedure for archeological properties by the State Historic Preservation Office in the Department of Arkansas Heritage. The Arkansas Archeological Survey celebrates its 50th anniversary in 2017. Our mission to study and conserve the state's archeological heritage and to communicate our knowledge to the public was established by the Arkansas legislature with passage of Act 39 in 1967. In honor of that occasion, we are posting weekly “Historic Moments” to share memories of some of our most interesting accomplishments and experiences. THE SURVEY'S MISSION is to study Arkansas' past, to preserve and manage information about archeological sites, and to share what we learn with the people of Arkansas. We invite members of the public to help discover and record information about archeological sites in Arkansas. *Information about archeological site locations is exempted from the Arkansas Freedom of Information Act to protect our state’s fragile archeological resources from looters and to protect the privacy of landowners with sites on their property. Our archeologists do not appraise artifacts or guarantee their authenticity for commercial purposes.